Antibiotics are the best gift to the mankind by the medical field. Before the invention of antibiotics millions of people used to loss their lives in infectious epidemics. While these wonder drugs are now abundantly available we are not using them properly and thus are increasing the incidences of drug resistance, infection recurrence, and side effects. Here are few points to remember while using an antibiotic. 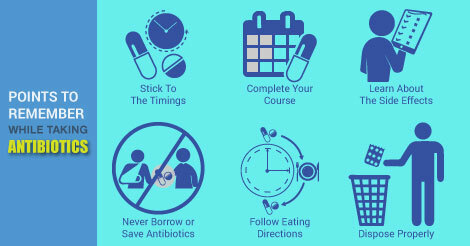 Antibiotic courses may last up to 2 to 5 days or more in some cases. These dose regimes are developed following proper research of the drug effect on the infective organism. It is very important to complete the course of the drug even if you feel good after one or two doses. Incomplete doses may lead to recurrence of the infection. Also, incomplete doses can make you resistant to the medication and next time it might not help you. The bacteria developed in the body after incomplete dose becomes resistant to the drug. You can infect your family and friends with these more powerful bacteria if you do not complete your course. Pop your medication on fix time daily for the duration of drug regime. This is necessary to ensure proper drug concentration in the blood and therefore avoid the development of resistant bacteria. Many antibiotics must be taken before meal and many after meal. Make sure you know the eating directions properly, otherwise it can affect the absorption of the drug in the body. In many cases food items like milk and milk products, calcium supplements, and grapefruit should be avoided with antibiotics. Please ensure you have the list of restricted food items while on antibiotic therapy. Antibiotics are prescribed according to the signs and symptoms of an individual patient at a given point of time. Sign and symptoms of different types of infections may be the same sometimes. Therefore, never use leftover antibiotics without consultation with physician. Never borrow antibiotics from other patients with the symptoms similar as yours. Many antibiotics leads to common side effects like nausea, vomiting, diarrhea, blackening of stool, redness in urine, ringing in ears, and so on. Make sure you know about the common side effects of your antibiotics to avoid panic attacks and to also identify any unusual side effect. In case of any unusual side effect, contact your physician immediately. Dispose antibiotics properly to avoid their accidental intake by pets and children.